There is always a potential danger in choosing readings that too much will be left out. It is true that the one year lectionary historically did not include Old Testament readings, and therefore these choices were often made to fit the existing ones. Occasionally, this focus toward the New Testament leads to an unusual choice, especially when that selection is narrowed to keep the reading relatively short. 2 Chronicles 28:8-15, the Old Testament reading for the Thirteenth Sunday after Trinity, is a good example of this difficulty. It is plainly chosen to mirror the parable of the Good Samaritan, but the shortness of the reading leaves out many details which would show that the parallel between the two is not as strong as one might hope. This is, of course, a problem with the lectionary, not with the passage itself. King Ahaz of the southern kingdom of Judah, the son of righteous Jotham, the grandson of righteous Uzziah, was deeply wicked. It was not enough for Ahaz to walk in the same path as Jeroboam, but he also copied the religious practices of the surrounding nations. He made metal images of the Baals and sacrificed in every high place and under every green tree. As if all of this were a light thing, he even burned his own children as a sacrifice “according to the abominations of the nations whom the Lord drove out before the people of Israel” (2 Chronicles 28:1-4; also 2 Kings 16:1-4). Godless Ahaz even had the audacity to pretend to piously refuse to put the Lord to the test, even when the Lord commanded him to do it through the prophet Isaiah (Isaiah 7:10-12). 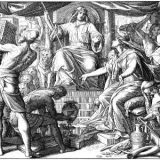 Meanwhile, Pekah, the king of Israel, who was coming toward the end of his reign (2 Kings 15:27; 16:1), was trying to regain some of his original power. Tiglath-pileser, the king of Assyria, captured part of the northern territory of Israel in Pekah’s reign and carried off Naphtali (2 Kings 15:28). Pekah therefore sought an alliance with Syria, who were located to the northeast, as a way of pushing back against Assyrian encroachment as well as regaining some of that territory. It is this alliance that caused Ahaz to be afraid (Isaiah 7:1-2), because he felt that he could not withstand such an attack. Israel and Syria did in fact attack Jerusalem, just as Ahaz feared, because the Lord sought to punish Ahaz for his wickedness. However, the attack proved somewhat futile, as they were not able to take Jerusalem. Rezin, the king of Syria, managed to take Elath for Syria, but they did not conquer more than this (2 Kings 16:5-6). Ahaz, instead of trusting in the Lord like he should have, sought an alliance with Tiglath-pileser. As a way of gaining Assyria’s favor, Ahaz took some of the gold of the Temple and sent it as a tribute (2 Chronicles 28:16-21; 2 Kings 16:7-9). This, of course, only made the situation worse. Here was a fine dilemma: the kings of Israel and Judah both seeking foreign alliances like pagan kings instead of trusting in the Lord! This, then, is the context for the reading for the Thirteenth Sunday after Trinity. Israel takes the people of Judah captive, treating them like the spoils of war rather than as their brothers. Moses made it perfectly clear that an Israelite could not own another Israelite as a slave (Leviticus 25:39-46), but this civil war showed just how far Israel had strayed from the ways of the Lord. 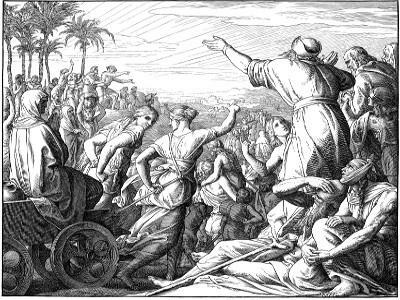 This was not the first civil war in Israel, but like the war with Benjamin, Israelites were following the wickedness of their neighbors. Gibeah imitated Sodom, Israel now imitates Assyria (see Judges 19:22-20:48). But not all hope is lost. As they bring the captives northward to Samaria, the capital city of Israel, a prophet named Oded confronts them. Even in the midst of the idolatry of Israel, there are still some who follow after the Lord. Many of the great prophets proclaimed their message within the northern kingdom (Elijah and Elisha both, for example). Oded proclaims that while God had used Israel to punish Judah, Israel had added sin upon sin by taking Judah captive (2 Chronicles 28:9-11). While God may indeed use a man as His instrument, whether for blessing or for judgment, this is not a pretext for doing whatever that man pleases. God works through men, because He is able to use evil for His own good purposes, but men remain culpable to God for their sins. Some of the leaders of Ephraim also speak against this great sin. 7,000 have not bowed the knee to Baal in Israel, though this does not mean that Israel is not guilty. Sin is not as individualistic as we might want it to be. God says very clearly regarding idols, for example, that “you shall not bow down to them or serve them, for I the Lord your God am a jealous God, visiting the iniquity of the fathers on the children to the third and the fourth generation of those who hate me” (Exodus 20:5). He may very well cut off a whole nation because of the sins of a few. God closed the wombs of the house of Abimelech because of his sin toward Sarah (Genesis 20:18). 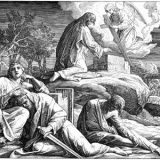 Israel suffers defeat because of Achan’s greed (Joshua 7). If sin affects only the individual, then Paul’s command to cast out the incestuous adulterer in Corinth makes no sense. Rather, “a little leaven leavens the whole lump” (1 Corinthians 5). Even Ezekiel’s clear statement that each man dies for his own sin does not fight against this, because he is speaking against those who believe that they are innocent and suffering unjustly. They are in fact not innocent, because they participate in the sins of their fathers (Ezekiel 18). Finally, the men of Ephraim do everything that they can to help the captives of Judah by showing them great mercy. This is likely the reason why this passage is connected to the parable of the Good Samaritan in the lectionary. Instead of treating them like slaves contrary to the Law, they treat them as their brothers. One should be careful to note the following points, however. First, Samaria is a city, not a region or a people group, so Samaria and Samaritan in this case are not the same thing. Samaritans do not even yet exist, because Israel has not yet gone into exile (2 Kings 17:24-41). Second, Israel will still go into exile because of their sins. While these men of Ephraim may fear the Lord, Israel as a whole must still be punished. Pekah himself will be deposed shortly after this event, doubtlessly because of his sins (2 Kings 15:30). Lastly, it is worth noting that in the parable of the Good Samaritan, it is a foreigner who acts like a neighbor to the dying man. Here, some men of Ephraim act like neighbors to the men of Judah. The two are similar in that respect, but 2 Chronicles 28 is not an Old Testament parable of the Good Samaritan. One should resist the temptation to rush forward, as if the Old Testament is only the New Testament in disguise.